Northwestern and Illinois played their third nail-biting match of the year in the Big Ten semifinals, but this time the Wildcats came out on the wrong end. The No. 13 Cats fell to the No. 17 Fighting Illini 4-3 in the teams’ third meeting of the season. 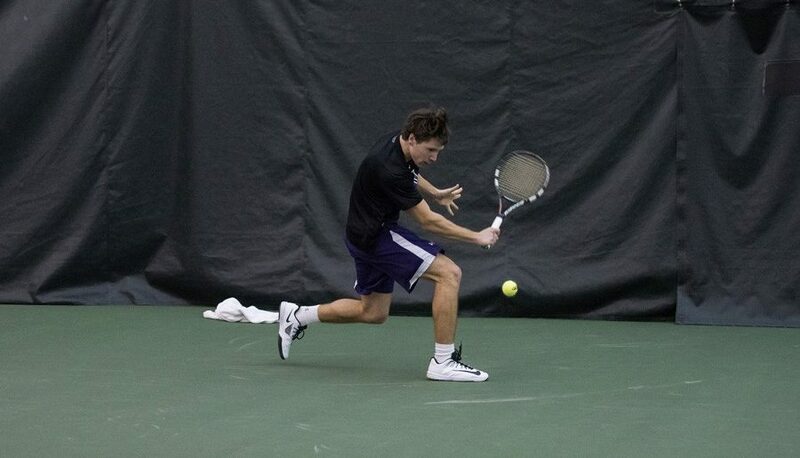 NU got off to a good start Saturday by winning the doubles point as they had in their earlier victory. Juniors Sam Shropshire and Konrad Zieba quickly won at No. 2 doubles 6-0, and the pair of junior Alp Horoz and senior Mihir Kumar won in tiebreaker 7-6 (1) at No. 3. Freshman Ben Vandixhorn, the winner of the clinching match in the previous match against Illinois, won 6-1, 7-5 to put the Cats up 2-0. Zieba then lost to the No. 4 player in the country, Aleks Vukic, by a score of 6-2, 3-6, 6-2, Zieba’s third loss to Vukic in three sets this year. Senior Fedor Baev also lost for the third time this year to Julian Childers, 7-5, 6-3, tying the match at 2. Then junior Strong Kirchheimer avenged his only loss of the dual season thus far with a 5-7, 6-2, 6-2 win over Aron Hiltzik to put the Cats one match from the finals. However, the team’s repeatedly-state goal of winning a Big Ten championship would not come as Shropshire and Horoz both followed with losses in tight three set matches. NU will now prepare for the NCAA tournament, which starts in two weeks. The top-16 teams in the nation get to host a Regional Championship match, but with the No. 13 ranking, the Cats sit on edge of that mark heading into the tournament. Copyright © 2019 Cats Corner. Powered by WordPress. Designed by myThem.es.